Sears Holdings reported another big quarterly loss last month. Not surprisingly, investors are fleeing the stock. Shares of floundering retail giant Sears Holdings (NASDAQOTH:SHLDQ) plunged 27.9% last month, according to data from S&P Global Market Intelligence. It was just the latest bad month for Sears, as the company's turnaround efforts over the past decade have been consistently futile. Indeed, Sears Holdings stock has plunged from a peak near $200 in 2007 to single-digit territory. Sears shareholders have received some value from the spinoff of various subsidiaries, but they have still lost most of their money in the past 10 years. 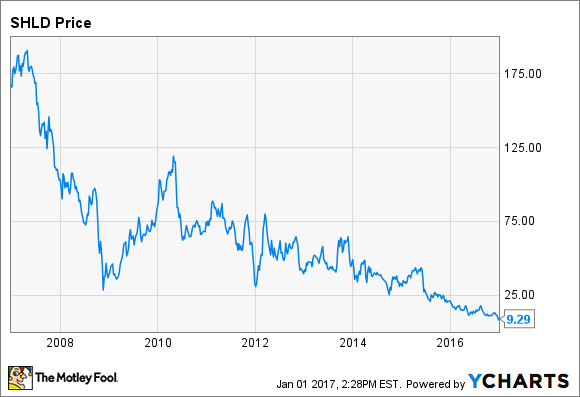 Sears Holdings 10 Year Stock Performance, data by YCharts. Most of Sears' December stock decline came after the company released a dreadful Q3 earnings report early in the month. Surprisingly, Sears stock actually rose on the day of the earnings report, but it proceeded to lose a third of its value in the following three weeks. Not only did Sears post a double-digit revenue decline in Q3, its gross margin plummeted to just 19.1% -- about half the level that is typical among department stores. This indicates that consumers aren't interested in buying Sears' merchandise unless it is deeply discounted. As a result, the company posted another massive loss. The major credit-rating agencies expect Sears to burn about $1.5 billion of cash on an annual basis for the foreseeable future. In the past few years, Sears has offset its massive cash losses by selling and spinning off various assets (mainly real estate) and small pieces of its retail business. However, this strategy can't be sustained much longer. Sears continues to close lots of stores. Image source: The Motley Fool. In late December, Sears Holdings announced a new round of store closures. Additionally, Eddie Lampert -- the company's controlling shareholder -- stepped in to provide a new letter of credit facility that will marginally improve Sears' near-term liquidity. However, neither of these moves addresses Sears' long-term problems. The company still has various real estate assets and valuable brands that it can sell off to remain solvent this year -- and perhaps for another year or two beyond 2017. Unfortunately, buying more time won't improve Sears' chances of survival in a meaningful way. Investors should stay away from this slowly sinking dinosaur of the retail industry.